My love affair with beets began in the dormitory dining hall my sophomore year of college. I’d never had a beet before, but after watching my friend Mimi pile her plate high with ruby red shreds from the salad bar each day, I decided to give them a try. My initial impression was that of swallowing a mouthful of soil. But I refused to believe that a food so beautiful could taste so awful, so I pressed on and tried them a second and a third time, until the flavor slowly began to grow on me. The time I tasted my first homemade oven-roasted beet, however, firmly cemented the root vegetable as one of my very favorite foods. Nowadays, there’s almost nothing I love more than a warm, fresh-out-of-the-oven beet. But hour-long roasting times just won’t do for weeknight dinners. 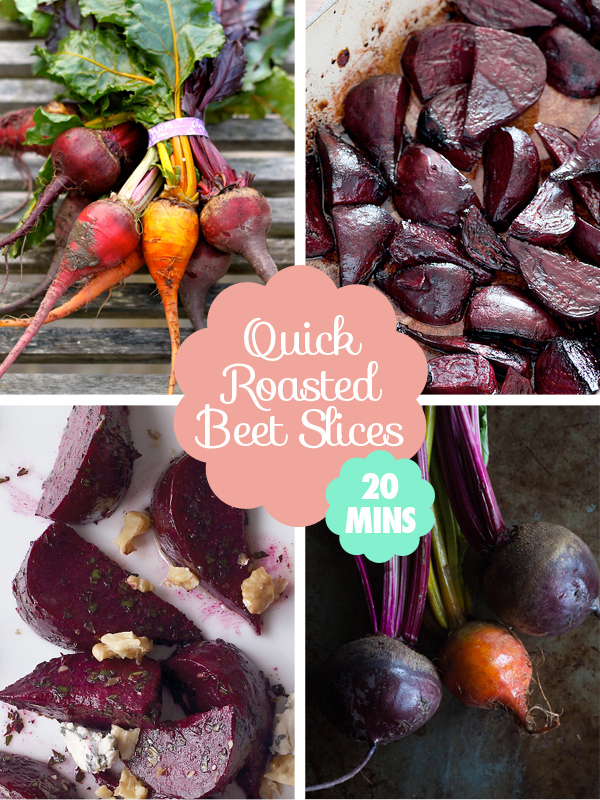 That’s why Fast, Fresh, & Green’s Quick Roasted Beet Slices recipe has been a real game changer for me. With only four ingredient and 20 minutes, you will have delicious, blistered-to-perfection beets. Preheat the oven to 475 F. Line a large, heavy-duty rimmed sheet pan with a piece of parchment paper. Put the beet slices in a mixing bowl and toss thoroughly with the olive oil, thyme, and salt. Arrange the slices, evenly spaced, on the sheet pan. It’s OK if they touch. Roast until the beets are tender, shrunken, wrinkled, and glistening, 16 to 18 minutes. The smallest slices will be black around the edges. Let cool for a few minutes before serving or using in another recipe. I like to throw a few carrot slices on the roasting pan as well, and use close to double the amount of thyme that the recipe calls for. I’ve also found that my beets take closer to 20 minutes to roast, but that may be because my slices are a little bit on the thicker side. This entry was posted in Food + More, Kitchen Tidbit and tagged "roasted beets", beets, cooking, food, quick, roasting, vegetable. Bookmark the permalink. Aaaah… just what I was looking for (no time for 40 – 60 min hour roasting today, and I have such lovely beets from the market)… thanks for this recipe!